Discover beautifully healthy looking hair. Delicately enriched with Rosemary, Cedarwood and Certified Organic Lavender oil to gently cleanse the hair and scalp whilst enhancing your hair`s natural shine. Aqua (Water), Sodium Lauroyl Sarcosinate*, Lauryl Glucoside*, Cocamidopropyl Hydroxysultaine*, Sodium Lauryl Sulfoacetate*, Disodium Cocoamphodiacetate*, Glycerin*, Glyceryl Laurate*, Sorbitol*, Citric Acid*, Sodium Gluconate*, Sodium Citrate*, Sodium Cocoyl Glutamate*, Rosmarinus Officinalis (Rosemary) Leaf Oil*, Lavandula Angustifolia (Lavender) Oil*, Cedrus Atlantica Bark Oil*, Elettaria Cardamomum Seed Oil*, Eugenia Caryophyllus (Clove) Leaf Oil*, Sodium Hydroxymethylglycinate, Linalool^. 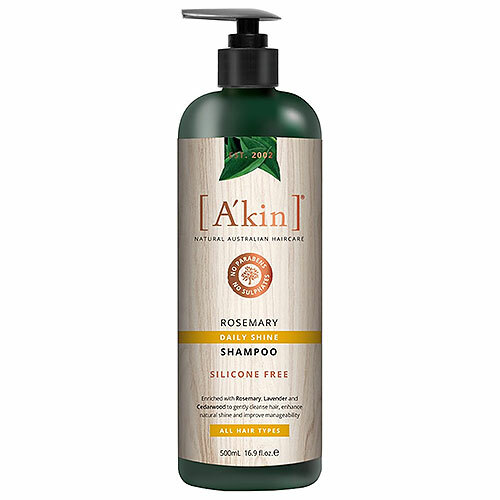 Below are reviews of A kin Rosemary Shampoo - For All Hair Types - 500ml by bodykind customers. If you have tried this product we'd love to hear what you think so please leave a review. Discover beautifully healthy looking hair! Delicately enriched with Rosemary, Cedarwood and Certified Organic Lavender oil to gently cleanse the hair and scalp whilst enhancing your hair`s natural shine.